A couple of weeks ago I shared with you that I have a weakness: understanding and implementing strong plot structures. As I look back, this has always been a weakness. I even wrote a bit about it in a post called “To Plot, Perchance to Scheme” over a year ago. At the time of that entry I thought the problem was in the book. Not the author. The first two books I penned seemed to have vibrant plots that carried the characters along to a satisfying conclusion. Ah…but the more you learn, the more you realize you don’t know…or something like that. I realize this is a piece of my writing education that needs some attention. I can’t wait for a conference. I can’t attend a class. There doesn’t seem to be one available to me for the summer session. I have three options available to me at this point: On-line study (an internet search of my own or perhaps there is a course out there) read and study books written on the subject, or connect with other writers in my area to discuss the topic. Money and time are resource issues. I’m watching for a webinar to pop up. Hopefully, a freebie. In the meantime, I did a quick internet search for “plot structure.” There are a number of short articles available on the topic. Many of them appear to be directly taken out of a high school English textbook. Linear elements such as exposition, rising action, climax, and resolution are defined. I may have left one out there. 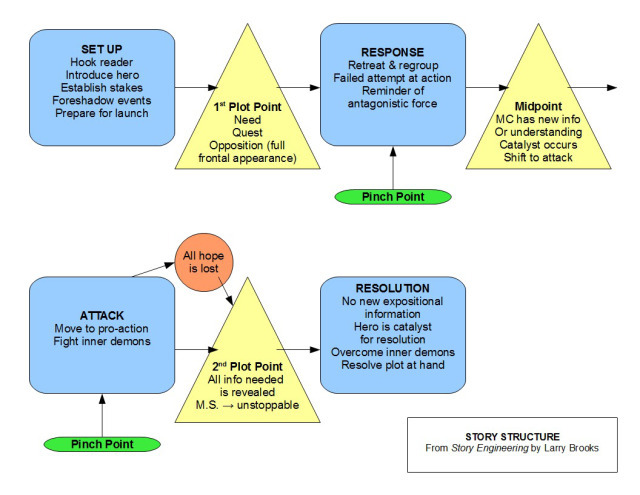 However, I did find a particularly helpful post regarding Larry Brooks’s blog series about story structure. I remembered reading the original series on the Story Fix blog. In essence, Brooks guides the writer to divide the events of the story into several sections. In the first quarter of the book, the set-up, the writer needs to introduce the characters and end with a pivotal point –that point in the story where we first see the story problem. The writer needs to craft a response to this crisis, which of course will be insufficient. He goes on to identify where the story should be about 3/8 of the way through, at the halfway point, what should happen 5/8 of the way in, and at the third quarter mark. 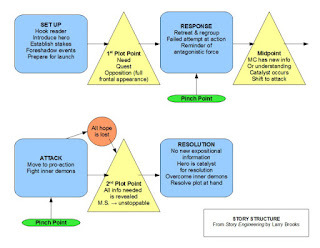 Author Julie Glover translated the plot structure Brooks outlined for one of her books in this flow chart. You may be interested in checking out her blog as well. She writes Young Adult fiction (YA). Oh to be a young adult once more….nah….been there…done that. After I searched out what I could on the internet, I decided to enhance my education at the local library. I found a helpful little handbook of sorts published by Writer’s Digest Books. The book has the catchy title Plot and was written by Ansen Dibell. So what does all this mean in my quest for strengthening my skill at story structure? I need to have a path of where I think my story will go. I need to write action scenes to move my reader along that path. But if I come across another interesting route, I shouldn’t be afraid to change my travel plans for a bit and explore. The structure tool offered by Brooks doesn’t have to show up at the beginning of my writing. I can apply it in the revision process, weeding out the unneeded details bogging down my story and beefing up the elements that reveal those pivotal points to my reader. What do you think? How do you, say, plot along…? Thank you visiting A Novel Creation today. 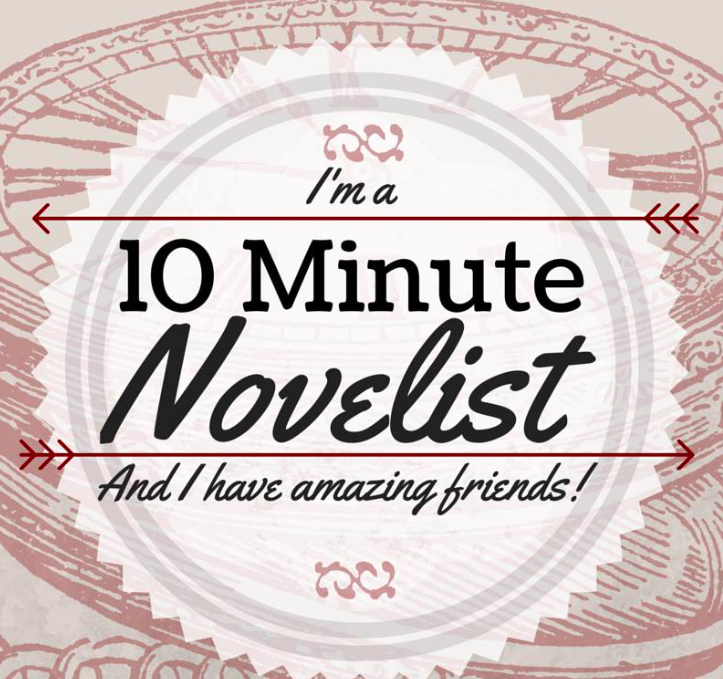 Please take a moment to leave a comment or share the post with your “writerly” friends. As I shared last week, I have been reviewing and revising my business plan. Part of that has led me to look at the area of engagement. Some of this is reflective, some is exploring where I go from here. In December of 2011, my husband and I had decided we would retire at the end of 2012. I had one year to close out any projects I had at work and figure out what I would do with my life. I distinctly remember the February morning in 2012 when I woke up and announced to my husband I was going to be a writer. I couldn’t see myself fishing every day. Or golfing. I like both, but I knew I would need something more engaging. I prayed about it and on that February morning I realized retirement was my opportunity to pursue a dream. I would write. As I learned more about my new career choice, I learned there was more to it than crafting a story others would read. One of the hurdles I needed to jump was that of social media. As I said last week, I knew very little about Facebook, nothing about Twitter, and only had a Pinterest account because my daughter set one up for me. I thought blogging was a public diary of sorts and not my cup of tea. I knew I needed to engage with other writers, editors, and readers in meaningful ways. At least that’s what the research told me. But how? I didn’t realize the interconnectedness of social media and engagement at the time. Duh. Don’t laugh. I was a newbie. I would read what others posted on Facebook. It was nice to keep up with the lives of friends and family, but I rarely posted anything myself. Who would be interested in the “goings on” of my life? The education piece of my initial business plan included a writing conference. I attended my first writing conference that May. Everyone was talking about social media. I picked the brain of one writer I met at lunch who talked about engagement with her readers through her blog. I met another who explained to me why I should have a separate author page on Facebook. Both of these women spoke of how wonderful it was to live in this age of technology. I hadn’t thought about it that way. So I started this blog. I had no idea what I was doing. A publisher at the conference suggested I write about writing. Now I kind of wish I had taken a different route, but it is what it is. I set up my author Facebook page. I started pinning to my Pinterest account pictures related to my book as well as everything else I liked. I opened a Twitter account and found out I really like the platform. Talk about connecting with others! Twitter is quick, straightforward, and to the point. All of this to say, AS A WRITER YOU MUST ENGAGE WITH OTHERS. REGULARLY. Publishers and agents will likely tell you to engage to increase readership. A following. But I think there are bigger benefits. My middle daughter met her husband while she was serving as a missionary overseas. He lived in Illinois at the time. They met when he volunteered to work with her mission field for a ten-day stint. They began communicating via email. Romance limited to written communication forces each participant to use the words carefully, to make sure the statements are accurate and use structure to convey feelings. Danielle and Tim became better at written communication than they ever had in their entire lives. I know my writing has improved through blogging on a regular basis. It would likely improve by the mere act of writing daily. But it has also improved because some of my readers leave comments or ask questions. Some message me on Facebook or email me with their reflections and feedback. It helps me find direction. By the way, as I understand it, leaving comments on the post helps boost visibility for the blog. If you’re considering blogging, I wrote a post called Bumfuzzled Blogging last year. Click on the title to access it. In addition, I am certain I have learned to make every word count because of Twitter. 140 characters. Honestly. In 140 characters you can share almost anything on your mind. If you can’t, you may be too wordy for your own good. So, yes, engaging in these activities can help you become a better writer. But let’s face it you could become a better writer by keeping a journal or practicing writing in 140 characters every day without ever posting anything online. But the engaging with others bumps everything up a notch. Other ways you can engage include joining a reading group or a writing group. Meeting with other readers on a regular basis helps you remain relevant. Meeting with other writers on a regular basis helps you stay accountable. For example, our local library hosts an adult reading group that meets monthly. A book is chosen, copies are ordered, and members sign up to participate. The discussions are lively and interesting. I have read books I would have never touched because of the reading group. The readings stretch me. I don’t participate every month, but I keep watch on the books selected. You can do something similar on Goodreads. You can engage in an online book discussion. It is interesting. I am a part of online writing groups and critique groups as well. One of the benefits of engaging with other writers online is that there is always someone “out there” to chat with or to offer advice. One of my joys is meeting face-to-face with some of my writer friends. I joined the Ohio Chapter of the American Christian Fiction Writers (ACFW) a couple of years ago online and began going to some of the monthly meetings this year. I love these people! We are on the same page in many ways and all working to better ourselves. We laugh together, encourage one another, and offer insights along the way. Writing is a social dance. It is give and take. A sharing of ideas and knowledge. Writing is an act of engagement. It is a natural way for us to connect with others. The challenge is to make those connections more intentional. What do you think? Please take a moment to leave a comment or to share this post with your friends. Let’s connect. Today I want to address Evaluate and Educate, with only a nod to Exercise and Edit since I have talked about both in previous posts. Next week I want to look at Engagement. This is not the most experienced writer handing down words of great wisdom to the masses. No, it’s me. I’m going through a period of revising my business plan so these elements are near and dear to my heart right now. If you really want to be successful in your writing ventures, you need take some time to evaluate your own strengths and weaknesses as a writer. I look back at my early efforts to evaluate my status and laugh. There was so much I didn’t know, I didn’t know what I was missing! I knew was a strong researcher and weak when it came to social media. I didn’t even know what a blog was nor did I have an inkling how to set up a Facebook page. In fact, my grad assistant set up my first Facebook page for me. I use it as my personal page. I’ve learned much more about social media since that time. Not everything. But enough that it is time to do a bit of reevaluation and discover what’s next on my hit list. I invite you along on the journey. Think about those areas of strength you have as a writer as well as those areas of weakness. I’m not just talking about what you want to learn, but rather those areas where you feel truly weak. Maybe an example would help. I want to learn more about self-publishing. I think I have a few nonfiction works I want to put out there, but don’t want to necessarily go through a traditional publisher. It isn’t that I am weak in that area. I don’t know enough about it. I know enough about technology to self-publish and there are many tutorials on the subject. It is a matter of writing, editing, revising, editing, and uploading to Amazon. However, a weakness I have noted is my own understanding of differing plot structures. If you haven’t guessed, that’s a biggie in fiction writing. I think that maybe intuitively I understand what my story calls for by way of structure, but I don’t readily recognize pitfalls or problems I create that could easily be solved if I could articulate the structure or underpinnings of my story. Does this make sense? Maybe not. It is a weakness for sure. What weakness in your writing is holding you back? Now that you have a notion of those areas where you are weak, you need to devise a plan to address those weaknesses. This is what I call the education piece. Yes, I could hire a content editor to do help me identify the problems in my plot, but I (and my writing) will be better served if I learn some of those skills on my own. How? There are lots of options. I can start with an online search for blogs about the subject. I can sign up for a workshop or a writing course at the local junior college. I can tap into some books at the library. I can sign up for a free webinar on the subject and pick the brains of more experienced writers. I can educate myself. It may take a bit of time and a lot of “homework,” but the end result will be worth it. This really should be more than a nod! Without editing, your writing is worthless. Who wants to read something unedited? Okay, your mom. But that’s it. As a child, I despised the chore of weeding the garden. At first, that’s what I thought editing was –a chore. Out with the worthless, nurture the meaty. If editing is your weakness, you need to work on that skill. There is editing and there is editing. The two big ones you can readily address are editing for content and copy-editing. Editing for content is like making sure the Beans are in the bean row and the corn, when it grows tall, won’t overshadow the tomatoes. In other words, make sure your story makes sense, the characters are consistent, and so forth. Thank you for visiting today. I would love to hear from you thoughts about your own writing. Have you identified a weakness? What is your plan to address it? Drop a quick comment in the comment section, if you will, or take a moment to share the post with your other writer friends. I am so excited to introduce to you today a sweet writing friend, Katharine Grubb. Katharine is the author of a new book called Write a Novel in Ten Minutes a Day. That's right! Ten minutes a day! 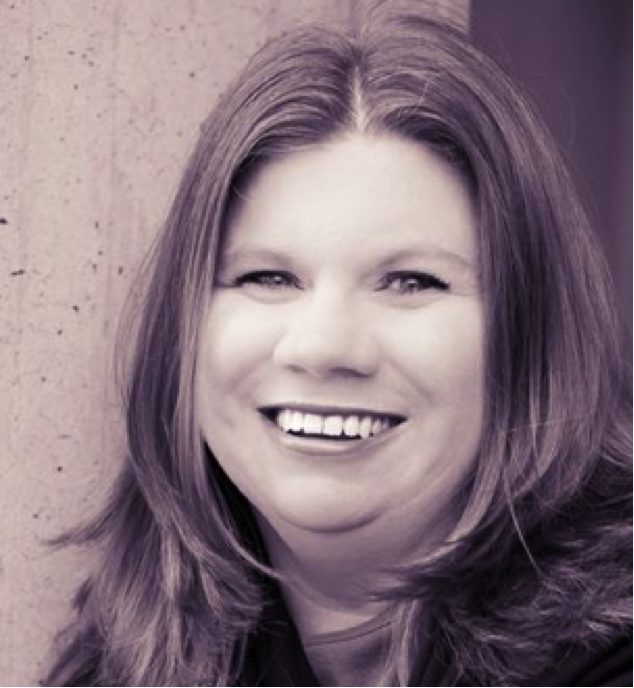 I hope you enjoy this interview and I hope you'll check out Katharine's book. Me: Thank you, Katharine for joining us at A Novel Creation. Most of my readers are avid readers who enjoy a peek “behind the scenes” or they are aspiring writers who appreciate learning more about every aspect of the writing process—from draft to publication—everything in between and everything beyond. 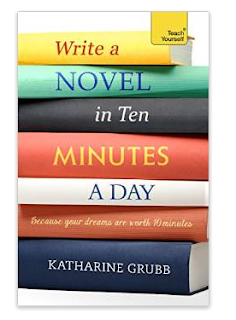 You just released a book for time crunched writers called Write a Novel in Ten Minutes a Day: Because Your Dreams are Worth 10 Minutes. Could you start by telling us about the book? Me: Tell us a bit of your previous writing experience…what brought you to this point? Katharine: This is a big question. I remember being four years old, given a blank sheet of paper and a pencil and my first instinct was, “Let’s write a story!” I was frustrated my fine motor skills were not as fast as my brain. My first grade teacher was big influence on me and she must have assigned writing stories every week. I wrote a lot about kittens. (Becky, I HAVE those stories. I could easily send you photos. They’re very amusing!) If anyone had asked me as a first grader what I was going to be when I grew up, I would have said, “an author!” In high school, my English and journalism teachers were influential in challenging me and encouraging my love of writing. I was active in newspaper and yearbook and learned how to organize my thoughts and what it meant to have a voice. I went to the University of Oklahoma on a journalism scholarship thinking that I would be just as successful there as I was in high school. Sigh. That didn’t happen at all. I was very confused. My journalism classes were not just hard, they had a high standard. My many mistakes were far more than a steep learning curve. I often slipped into panic and anxiety attacks over my writing, trying to please instructors. This was happening about the same time that Jesus found me. After my junior year, I thought that God was telling me to give up writing because it had become an idol in my life. I changed my major to education. The truth was, and God’s gentleness was all over this, that I suffered from PTSD as a result of my abusive childhood. (I wasn’t diagnosed until 2013!) My anxiety attacks were triggered episodes. God got me out of writing for a season so I could be safe emotionally. Even though that meant three more years as an undergrad, my degree in education was far more marketable than my degree in writing. I didn’t pick up writing again until after I graduated. I connected with old friends who wanted to form a Christian comedy team and I signed on to act and write for them. In the two years we worked together I wrote 35 sketches and nothing trained me better in three act structure, than that. I also recognized my love for comedy and how I could write a pretty good one-liner. My voice was strengthened in that season. The next twelve years, I didn’t write at all because I married and had five children all in a row. I believed that God’s only plan for me was that of mother. I found this painful because I still loved to write and longed to call myself “author”. While watching A Snoodle’s Tale with my children, I wept and prayed that God would open some doors for me. Who would have thought that Veggie Tales would make such a profound difference? I stepped out on faith and read as many books on writing as I could get my hands on, started a novel in 10 minute increments and kept praying. I’m still amazed that he never wanted me to give up on writing and doing what he created me to do. The detours were important and worth it, but those dreams and desires are there for him to use, not to be squashed. This is an important message I want every writer I meet to understand! Me: You are certainly getting that message out through your media presence. 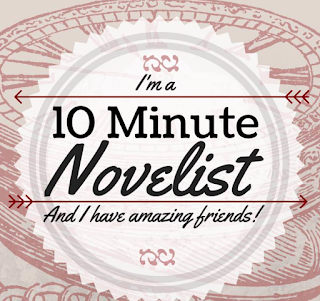 You've established a vibrant online community of writers on Facebook called 10 Minute Novelists and I know you’re active on Twitter. You’ve mastered Canva and other tools. What advice do you have for writers regarding technology? Katharine : Boy, technology is a tough learning curve. It’s easy to fall into the trap thinking that you have to know and do everything. You don’t. If you’re a beginning writer and beginning technology, I suggest concentrating on craft first and maybe one social media platform, like Facebook or Twitter or blogging, but not all three in the beginning. Write first. Worry about technology second. Months or years from now doors will open, ideas will spring up, and you’ll grow more confident. Also, don’t waste your time on things that are frustrating. If you have no need for CANVA (personally, I don’t know how I lived without it) don’t bother. I don’t do Tumblr or Instagram or Google+ even though they could be beneficial to my goals. I just don’t have the time neither to invest in it nor to teach myself how to maximize it. Me: You have an interesting story about how you secured one of the finest agents around, Chip MacGregor. Could you share a bit about that? I think it would be helpful for new writers in thinking outside the box… you know…Step 1, Step 2 isn’t always the best way to learn to dance. Katharine: There are a lot of ways to get an agent. And I had read some remarkable stories. Many of them came down to being in the right place at the right time. One way is through contests, like ACFW’s Genesis. I tried that and didn’t make it past the first round. 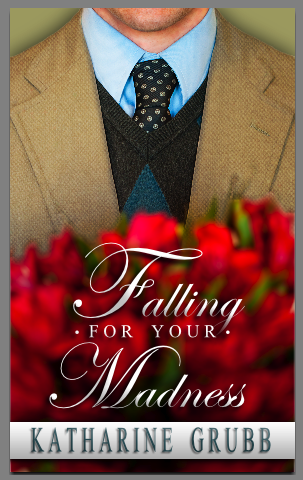 One of my judges wrote: “Is this supposed to be funny?” (Not a good beginning for a writer who leans toward the humorous.) I also knew that conferences were great places to meet agents — but I was never in a place financially to go. Then of course, you can write query letters and see what happens there, but the odds are against you. I thought querying was my only option. So I did my research. I figured out which agents represented the kinds of books I wanted to write. I also looked at which publishing houses they worked with. (Much of this information is on an agent’s website. It’s not hard to find, but you have to take the time to look.) I then read the agent’s blogs if they had one. The tone of a blog and the rapport the agents have with their writers comes through in their blogs. I knew that if I liked what I read — if I felt like they were warm and professional, flexible and fun, or if they had foresight for publishing trends —that’s the kind of agent I would want. Agents will say directly on their blogs what they do for their authors. I wanted an agent that would help me in the long term, someone who had a good reputation and someone whose authors and books I respected. I narrowed my choices down to three. I sat on this list for years. I did query other agents because my top three weren’t taking unsolicited manuscripts. I also prayed. I prayed that God would open the right door for me at the right time. Not too soon. Not too late. In March of 2013, when Hodder & Stoughton approached me to write Write A Novel In 10 Minutes A Day I did NOT say yes. I had read enough agents’ blogs to know not to do that. Instead, I said, “This sounds interesting. Please tell me more.” Then, of course, I screamed in joy like a crazy person in my house. For hours. The same day that I received this I emailed my top three agents. The subject line read, “Blogger’s dream comes true. I may have a book deal. Can you advise?” I sent them the same email. I forwarded the exact email from Hodder & Stoughton and told them that I very much wanted to write the book and, because I had been reading agents’ blogs for years I knew I didn’t HAVE to have one. My question to them was, do I need an agent to accept this contract. If I do, can you tell me what to do next? The next day, one of the agents responded with more questions but then dropped the ball completely. The second agent didn’t answer at all. But Chip Macgregor did! He had questions. He response was “I’m familiar with the contract Hodder & Stoughton uses. If you think you can manage a 27 page contract, you really don’t need one. It’s up to you.” This understandably caused more private screaming on my end. That’s all it took for me to feel like I needed one. And really, an agent? I wanted someone who would be with me throughout my career. Chip was in my TOP THREE. Yes, please. Two months later, Chip and I just happened to be in my hometown of Tulsa, Oklahoma at the same time. So we met face to face. I later attended MacGregor Literary’s annual marketing conference and met him again. Surprise! He’s a regular guy, who has funny stories and lot of experience and is willing to guide me as I create and market a long-term body of work, not just line his pockets with 15%. He negotiated my deal — and even raised my price! He guided me through signing my first contract and sent me my advance check! He also really like WANITMAD and has supported me in my marketing. I’m glad to have him on my team. Thank you, Katharine for taking time with us today! And thank you, readers for visiting today. Please take a few minutes to leave a comment or share this post with a friend.